At the MACH show, Andy Pye met with Universal Robots and some of their partner network. The products were interesting in themselves, but the real story broke a few weeks later – and took us by surprise too! Founded in 2005, Universal Robots (UR) is a manufacturer of smaller flexible industrial collaborative robot arms, based in Odense, Denmark. In 2008 the first UR5 cobots were launched on the Danish and German market. In 2012 the second cobot, UR10, was launched. 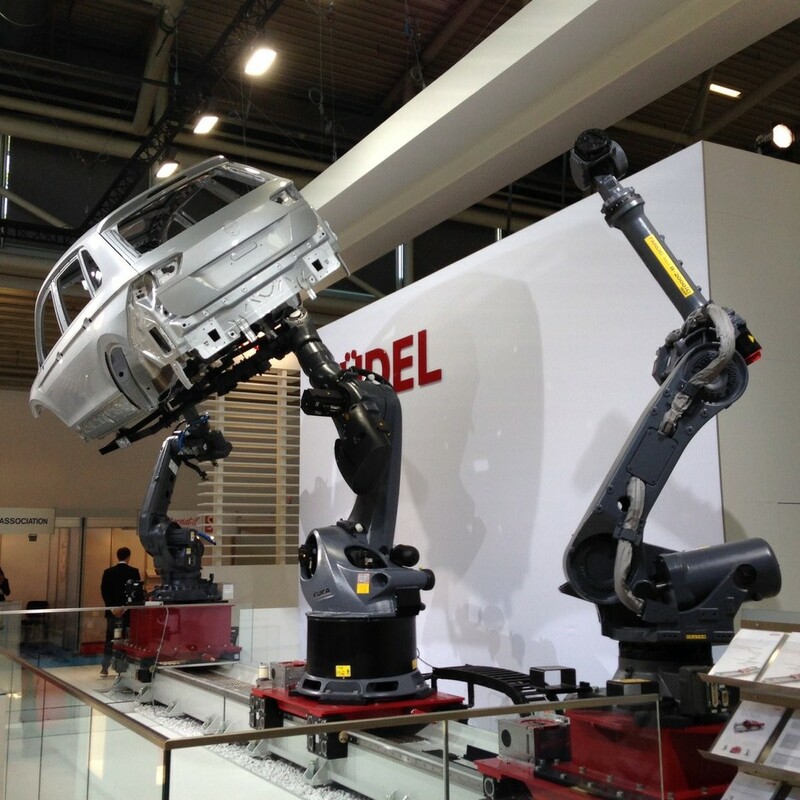 At Automatica 2014 in Munich the company launched a totally revised version of its cobots. One year later, in spring 2015 the table-top cobot UR3 was launched. All three are six-jointed robot arms with very low weights of 11, 18 and 28kg. The UR3 and the UR5 can lift 3 and 5kg and have working radii of 500 and 850mm. The UR10 lifts 10kg with a reach of 1300mm. The cobots’ joints can all rotate through +/- 360° and up to 180°/s. As we go to press, UR is launching the e-series, with new variants, the UR-e, UR5-e and UR10-e. These offer a built-in force/torque sensor, a new Teach Pendant with improved programming flow, and 17 new safety functions, including customisable stopping time and distance. Certified by TÜV Nord, all the safety functions are in compliance with the EN ISO 13849-1 and EN ISO 10218-1 (Cat. 3 PLd) machinery safety standards for unobstructed human-robot collaboration. Collaborative robots, which work safely alongside humans in applications such as packaging, quality testing, material handling, machine tending, assembly and welding, currently represent only 3% of global robot sales, according to the International Federation of Robotics. 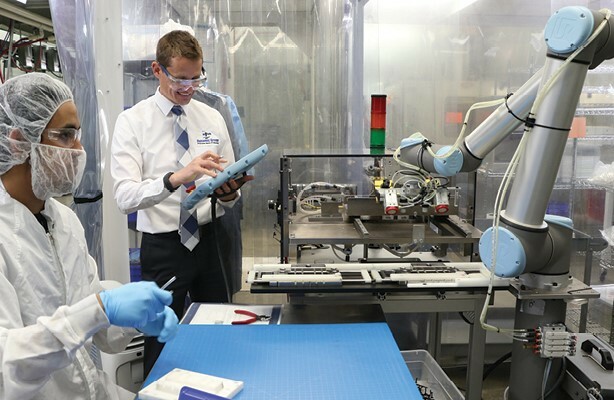 Due to their low weight and size, UR's cobots are mainly used within medium-sized businesses within industries such as packaging, automotive, pharmaceuticals, consumer goods, metal working, and manufacturing. 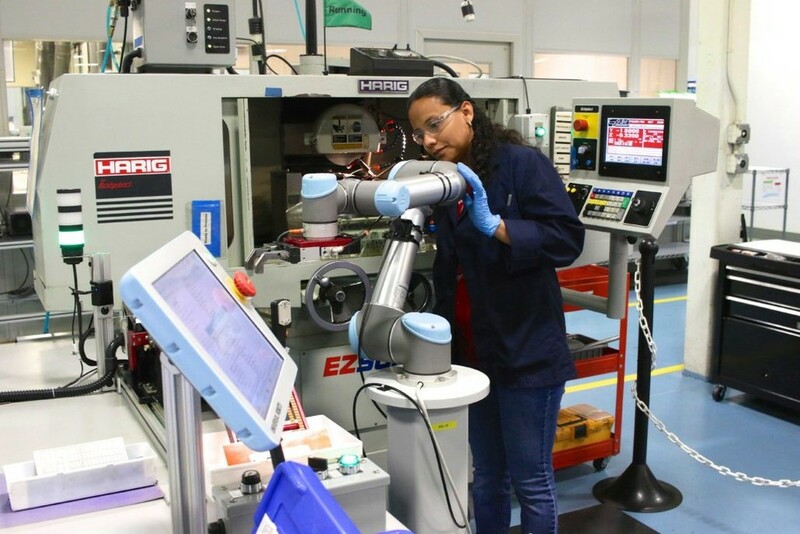 But cobots are also increasingly being integrated into very large manufacturers such as automotive plants, where they are taking over processes that cannot be automated using traditional robotics. Because of this, the share is expected to rise rapidly to 34% of a $25 billion market by 2025. On its own a UR arm is just an arm. But outfitted right it can achieve so much more. Caps - short for capabilities - are to robots what apps are to smartphones: useful accessories, hardware and software from independent developers, extending the capabilities of UR robots handling many different tasks, but designed specifically to work seamlessly with the UR arms. Perhaps a closer analogy for those of us old enough to remember it would be the companies that sprung up to support the original BBC Micro computer, enhancing its powers in many different directions. URCaps is a platform where distributors and integrators can present accessories that run successfully in UR robot applications at end users. The preliminary work behind the URCaps concept received funding from the European Community’s Seventh Framework Programme (FP7/2007-2013). As an example, the Danish On Robot provides plug-and-play electric grippers that mount directly on the robot arm, are highly flexible and are simple enough to be programmed and operated from the same interface as the robot without engineering skills. The Hungarian OptoForce provides force/torque sensors that bring the sense of touch to industrial robots so that they can automate tasks that would otherwise require the dexterity of the human hand. Now, OptoForce and OnRobot have merged into a single company, together with Los Angeles- based Perception Robotics, a developer of “bio-inspired” robot grippers, designed to to robots a sense of touch. The merger was masterminded by Enrico Krog Iversen, former CEO of Universal Robots, along with the Danish Growth Fund. In 2015, these parties sold Universal Robots to US-based Teradyne for $285 million.